Our newest product, the Vuelift Home Elevator, will change your perception of what a home elevator can be! It is a masterpiece of art and engineering. A stand-alone solution that does not require a hoistway to be constructed, Vuelift elegantly ascends within the home’s existing architecture. Enjoy full 360⁰ views from your Vuelift; an investment in beauty and convenience for today, it also ensures mobility and independence for the future. 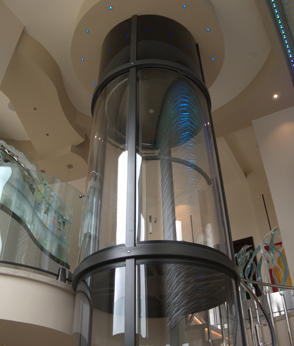 The Vuelift Home Elevator is available in two designs, round and octagonal. The round shaped elevator blends smoothly into any home acting not only as a mobility design, but an attractive addition. While perfect for renovations, it can also be the centerpiece of a new home design; many architects place the cylindrical elevator within a spiral staircase, or mirror its elegant curves in other design elements. Driven by a reliable, energy-efficient winding drum motor, your Vuelift will provide dependability and peace of mind for years to come. Choose the Vuelift Round for a home elevator that transcends convenience to deliver a ride that is an experience in itself. The unique octagonal prism shaped cab and hoistway sparkles like a faceted crystal as the centerpiece of your home. With a minimal footprint, Vuelift Octagonal fits into existing stairwells or spaces where a standard elevator may not be possible. Metal components are finished with lustrous powder-coat in virtually any color you can imagine to blend with your home’s décor, or provide dramatic contrast. Choose the Vuelift Octagonal home elevator for state-of-the-art design and uncompromised performance.